One of my favorite parts of summer eating is trying out and experimenting with new recipes, especially ones that don’t involve the oven. And my favorite type of summer meal is pasta salad. I love that it’s loaded with fresh vegetables and herbs, and that the only thing I have to turn on is the stove (and even that’s only for a few minutes). And who doesn’t love pasta? Though I have my time-tested, family-approved Easy Pasta Salad recipe, we decided a little while ago that it was time to try something new. The original recipe called for rotini pasta, but I like using shells. For some reason, this grocery trip I got the small shells though I meant to get medium, which I think work best with this. Either way, it’s a hit — there are never any leftovers! Mix together the tomatoes, garlic, salt, pepper, olive oil, vinegar, and basil. Cover and refrigerate for 2 hours. Cook pasta according to package directions. Rinse under cold water and drain. 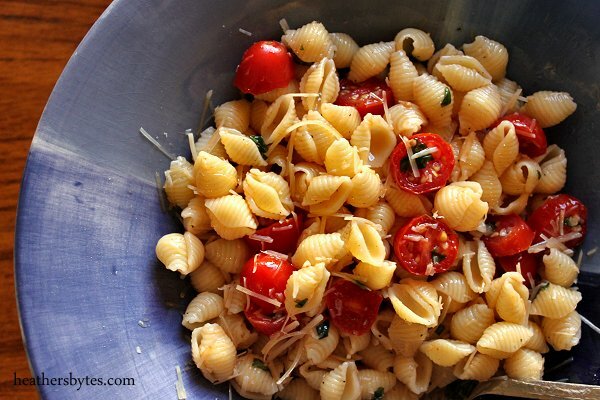 Mix pasta with the tomato mixture until well combined and refrigerate until ready to serve (at least four hours). Serve sprinkled with Parmesan on top. Zucchini Kielbasa Pasta is one of those recipes that I started out using years ago and which slowly morphed into something that fits my family a bit better. This happens pretty often and usually results in a family favorite. And though this is a family favorite, I actually forgot about it for a while. A year or so ago I went through and tried to organize all of my recipes. Most of them are just full-sized sheets of printer paper, and I figured the easiest way to reign them in was to put them in all sheet protectors in a binder. However, a few seemed to have been lost along the way and this was one of them, and I didn’t realize it until Mike was going through our external hard-drive this week and came across some pictures of it that I’d taken for some reason (I had to double check to see if I’ve already posted it and hadn’t, so I don’t know what the pictures were for). I have no idea what happened to the original print-out with all of my notes, but I’d made it often enough that even after so long I remembered the changes I’d made. Anyway, this is a great dinner for summer. There is no oven involved, and if you end up with an abundance of zucchini it’s a great way to use them up. You can also easily make it vegetarian by leaving out the kielbasa. In a large skillet, saute the zucchini, onion and red bell pepper in the olive oil until zucchini is tender (I usually put a lid on it for a few minutes to let the steam help it cook). Stir in the remaining ingredients and cook until heated through. Cook pasta according to package directions. Drain and return to pot. Pour the zucchini kielbasa mixture on top and serve. Long time, no see! The holidays always leave me feeling like I have to play catch-up with everything for weeks afterward, and, unfortunately, finding new meals to make tends to take a back seat! Anyway, over Christmas break we took the girls to a local Las Vegas restaurant called Anime Ramen, and being the teen and pre-teens that they are, they absolutely loved it. The food was good, too, and we decided that once things calmed down we were going to try playing with some homemade Japanese food ourselves. So last week we ordered soba noodles on Amazon and I got to work. This recipe for Soba with Sesame Sauce originally came from AllRecipes, but I’ve adapted it a bit below. The original recipe called for raw broccoli, but not everyone likes it raw, so I blanched it first: put it in a pot of boiling water for just a couple of minutes and then dunk it in ice water to stop the cooking. It gets rid of the rawness without losing all of the crunch. You can also use a bag of frozen broccoli, boiled for just a few minutes. I scooped the broccoli out with a spider so I could use the same boiling water for the noodles. I also added chicken breast to make it a bit more substantial for dinner. Make sure you cook it all the way through since it’s not going back into the heat (unlike a stir-fry, for example). If you want to make this vegetarian, just leave out the chicken. We were a little wary about eating it at room temperature (it felt like it should be piping hot!) but it was good, and this will be perfect for summer! Cut chicken breasts in one-inch strips and saute in 1 tablespoon of olive oil until cooked through. Set aside. Bring a large pot of salted water to a boil. Add the noodles and cook them for 4 minutes, or until just tender. Drain and rinse with cold water, and drain them again. In a large mixing bowl, mix together the vinegar, sugar, soy sauce, garlic, sesame oil, green onions, and chicken. Add the noodles, and the toasted sesame seeds. Toss well and stir in the broccoli. Let the dish sit for 30 minutes at room temperature before serving.